I use it to apply cream on my upper back. Makes it possible to reach areas that other wise I wouldn't be able to. The pad is a little small, you can't put as much cream on it. Very Simple and Just Perfect! The grip on the handle is a 'no slip' grip. That's nice. And it's not too bulky so I can apply just the right amount of lotion that I want to. And the long handle makes it so easy for me to spread the lotion onto those hard to reach places. What a helper this product is! Thank you so much! I have severe spinal arthritis and live alone. anyone for assistance. I'm going to stay independent as long as possible and this wand allows me to maintain a little of that independence. The product is exactly what I wanted. I need to get to apply lotion to my back and it works. Can use without the pads. I take it with me on any trip. Wonderful product, especially if you live alone! The handle helps me to reach all of those hard to reach places. And the applicator is petite and not too bulky so that I can apply just the right amount. Just the amount that I want to. Not one drop more nor one drop less. And it comes with replacement pads already with the order which is thoughtful. Thank you for this wonderful product that has been such a big help to me! I found my first one years ago in a catalogue, and have used them since. You can re-order the pads. Lotion, Suntan lotion, medication for itch. The larger wooden ones with a big pad take up too much lotion and are hard for me to maneuver. I am ordering another after I used the first one to death. great for someone who can't bend to apply lotion to their legs and feet. I looked all over, could not find the right product until I found this applicator in the catalog. Great, very useful. It works well to spread lotion on hard to reach places of back. Unfortunately, the lotion also works to "unglue" the sponge that holds the lotion. If you buy, buy extra sponges. Product is a great idea, but needs some modifications like larger head & be a little bit stronger plastic, I once had a handle break. Love the long stick but the pads are lousy. Just received this item last Friday and one pad was ripped by the end of that evening and another ripped two days later, so am down to my last pad after one weekend. This is a piece of junk. It's small and has an awkward plastic handle that slips around in your hand. I went to a store in town and found one twice as big with nice wooden handle and half the price. 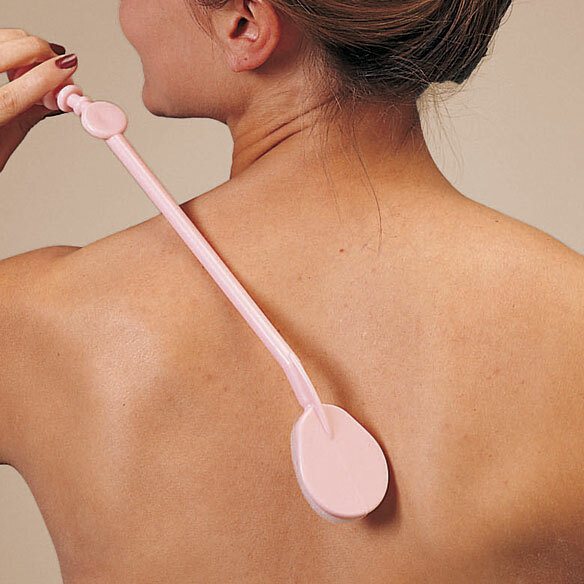 Nice for getting lotion on your back. I purchased this for my cousin, she is unable to apply medicated lotion to her back and lives alone so no one to help her. She said that this item realy helps her apply the lotion where needed. Pretty good aplicator. I bought it to apply tanning lotion but works good for body lotion also. Only problem is that the pads don't stay on the applicator too well when it gets wet to clean it. I recommend buying extra pads for it. I use this product to apply anti-itch cream to my back. I could not reach my back to put on lotion. This applicator works well and my back feels much better. Use product to put lotion on back. Bent head causes scratching on back, and limits areas of use. I found this product to small to be of use. It did not hold the lotion like I had hoped. I would not buy this again. To apply lotion to my back. The head isn't big enough to cover much of an area making it "clumsy" to use. Pads are "o.k.". Applicator is too flimsy to be of much use. I can't recommend it. Need to put lotion on back. Can you send me more pads to see if they will work? it dont work right,for me. i dont like it because it did,t work right for me. A great concept but the round handle is too hard to hold onto and maneuver the handle is too short The pad needs to be much larger. handle needs to be more ergonomic flat with rubber gripper rather than plastic. Same design as the roll-on lotion applicator design but with replaceable pads instead of the roller balls. The one with the screw one lotion applicator with the balls breaks to easily I've purchased several we got very few uses out of each before lotion compartment would crack. used it 2 times and the pad won't stick, plus the pad wrinkled and tore while using it. each pad 1 use, that's it. Thank you for your review. We are sorry to hear the Lotion Applicator was received defective. Please contact our customer service by email at easycomfortscsr@silverstarbrands.com or by phone at 1-800-296-5174 and we can assist you further. We apologize for any inconvenience this may have caused. To make it easier to put lotion on hard-to-reach places. I need something easy to apply my medicated creams to my back. I thought I would try and see if this will make it easier to apply. hip operation--other reasons need to put lotion on legs. I needed something like this, and the price was right. Bought one and it is such a convenience since I have trouble reaching my back, works great. Need applicator to apply medicine to my back. This is a reorder because it is so comfortable to use and cream. My back is very dry and I can't reach to lotion. I have a new prescription which needs to be applied to the back; I feel this item will help. This makes applying lotion to your back so much easier. I cannot reach lower part of legs and my feet to put lotion on them. Chosen for ease of application. Due to hip problems, I am unable to apply lotion to my feet. I'm hoping this will help. Great help when wanting to apply suntan lotion! Hoping that it will help me reach the bottom of my feet.it will be an incredible blessing.. I cannot bend & twist & I have very dry skin on my feet. The pad looks small enough to maneuver to all parts of my feet. I have RA and have difficulty reaching because of shoulder and neck pain. This response applies to most of the products ordered here. My 87-year old Mom needs this to apply lotion and pain relief cream to her back and shoulders. To facilitate the application of lotion on my back where it is difficult to reach. To be able to lotion my back. Necessary for long reaching as I am unable to bend and the easy reach applicator will serve me well. The necklace extender will extend my gold chain perfectly not needing a jeweler for extending my chain. 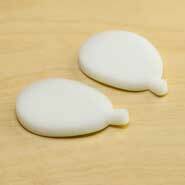 It's plastic, with foam pads for applying lotion or cream. do you put ointment on the pad or must it go thru the wand part? BEST ANSWER: I have only used the pad. Can lotion be put in wand ? BEST ANSWER: Thank you for your question. You apply lotion to the end of the wand then use the wand to apply the lotion. We hope this information will be of help to you. No. I use the pads that are sold with the applicator successfully for about 5 weeks a pad. You might be able to put lotion on the applicator...I just haven’t tried it. I can’t understand why the reviews are so wide apart in their opinions of this item. What’s the reason for this? Why does several give 5 stars and some only 1 star? Doesn’t make any sense. Can anyone in the community or company give some reason for this? Thanks! BEST ANSWER: Thank you for your question. The reviews are all based on customers opinions. It will depend on what a person feels the item should be. We hope this information will be of help to you.